A calling card film if ever there was one, Alfonso Gomez-Rejon’s Me And Earl And The Dying Girl applies the off-beat camerawork and meta-movie high jinks of his not-quite-remake of The Town That Dreaded Sundown to a geek coming-of-age story. Its values are pure film school: abrupt, artificial camera movements; unbroken takes that draw attention to their length; references that feel less like homage than compulsive listing. The exam-like “this is what I know, this what I can do” mentality produces plenty of zany aesthetic choices, but at the expense of qualities like character; this is one of those cases where the means largely obfuscate the ends, which aren’t that interesting to begin with. Which would be fine, if Gomez-Rejon—an American Horror Story veteran who spent time as an assistant to Alejandro González Iñárritu and Martin Scorsese—was more of a full-fledged stylist. A feature-length tribute to great directors with no direction of its own, his second feature is the kind of self-consciously quirky, slapdash movie that still leaves a viewer eager to find out what its director will do next. 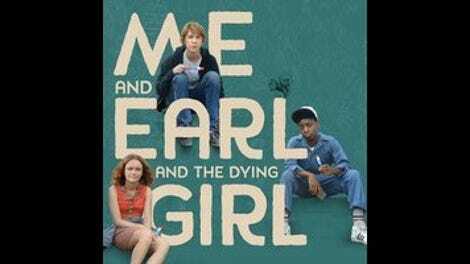 Adapted by Jesse Andrews from his own novel, Me And Earl is set over the course of a school year in Pittsburgh, as senior Greg (Thomas Mann) befriends Rachel (Olivia Cooke), a girl with leukemia, and hangs out with his lifelong best friend, Earl (R.J. Cyler). Greg is an amalgam of blank-slate white male coming-of-age protagonist tendencies and college-cool tastes; Rachel and Earl are single-trait characters—terminally ill and black, respectively—that only function as reflections of Greg’s maturity, or lack thereof. The characterizations are broad across the board, though the grown-ups are generally more interesting: Nick Offerman doing a kind of mirror-universe Ron Swanson as Greg’s dad, a sarong-wearing, cat-loving professor with a thing for exotic cuisine; Molly Shannon as Rachel’s mom, never seen without a wine glass; Jon Bernthal as Greg and Earl’s heavily tattooed history teacher. It’s a cartoonish teen movie about aesthetic values, though not artistic ones, quick to point out its own breaks with convention (e.g., it isn’t a love story, which qualifies it as fresh in today’s YA adaptation landscape) and chock-full of the kind of moves that get teenagers interested in filmmaking: straight dollies, whip pans, jokey title cards, self-aware voice-over narration. Though it’s refreshing to see a new American indie that puts this much stock into form, thinking outside the handheld-shot-reverse-shot box is only the first step toward a personal vision. No amount of arty compositions (courtesy of Stoker and Oldboy’s Chung Chung-hoon) can bring the relationship between Greg and Rachel to life, and one eventually begins to think of the plot—which finds amateur filmmakers Greg and Earl trying to make a movie for their new friend—as the thing that’s getting in the way of the quotes and name-checks that are the movie’s real raison d’être. There are send-ups of Andy Warhol’s Screen Tests, Powell and Pressburger’s Archers production company logo, and Errol Morris’ Interrotron interview system; hand-made parodies of A Clockwork Orange, The Conversation, and Breathless; semi-ironic quotations of the scores to Vertigo and The 400 Blows; and so many references to Werner Herzog that he could qualify for fourth billing. Though fitfully funny, these can’t mask the movie’s fundamental emptiness. The climax, set to Brian Eno’s “The Big Ship,” pulls out the ultimate young film-buff move by using a sublime piece of music to prop up a scene—basically a series of wordless reaction shots—that doesn’t work emotionally. For better or worse, it feels like the movie its protagonist would make, with plenty of movie-hip gestures toward nothing in particular.